Over the years, Sarah and I have used two different approaches to cut down on the cost of baby wipes. Both of them save significant money over buying wipes at the store. Our first approach involved doing almost exactly what’s depicted in the picture above. 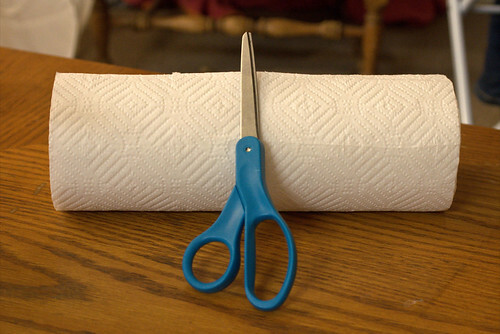 We simply took a roll of paper towels, cut them in half in both directions (so we had four pieces of the roll of equal size), and removed the roll in the middle. Then, we put one of those “quarter-rolls” into a baby wipe container. After that was done, we mixed together 2 cups hot water, 2 tablespoons of baby bath soap, and one tablespoon of baby oil. We mixed it slowly so it didn’t cause a lot of bubbling. Then, we just poured this mixture into the baby wipe container. After that, the paper towels were moist and worked perfectly for cleaning up our children during a diaper change. While this approach worked really well and was far less expensive than buying baby wipes, we were still filling up our trash can with waste. That’s when we moved on to our second approach. Sarah picked up a large piece of flannel cloth at the local fabric store, then we cut the flannel into a bunch of four inch squares. These made for perfect baby wipes. We also took an old spray bottle and filled it with a liquid mix identical to the one described above. A couple of sprays on the baby and a wipe with the cloth and we were ready to go. This second approach worked really well with cloth diapering, as we just tossed the cloth baby wipes in with the cloth diapers and washed them. This simple move eliminated the need to buy any wipes or paper towels for the purposes of cleaning up our children, but it did have the startup cost of a couple square yards of flannel cloth (about $3). We also found that having a bit of sewing skill helps, as putting an edge on these pieces of cloth greatly increased their lifespan (we’re still using them, actually). So, how much are these moves actually saving you? A wipe that actually does the job well costs about $0.03 per wipe. During an average diaper change, you’ll use about 2.5 wipes (that’s based on my own experience). Over the two and a half years an average child is in diapers, you’ll change an average of six diapers a day. So, you’ll multiply $0.03 times 2.5 times 6 times 2.5 times 365, giving you a total cost of $411. A typical roll of paper towels will produce about 160 wipes. You can get a good roll of paper towels for $1.22 a roll. You’re likely spending another $0.05 on the wipe solution per roll. So, your cost per wipe is $1.22 plus $0.05 divided by 160, or a bit over 3/4 of a cent per roll. Over the diapering lifetime of a baby, you’ll have a total cost of $108, saving you $303. If you go the cloth route, you’re investing about $3 in the initial cloth. You’ll toss the wipes in with your regular laundry, so there’s no upkeep cost. You’ll likely spend about $5 preparing the spray solution over the lifetime (I’m estimating high). Thus, you’ll be saving $403 over the lifetime of the child. Even if you’re comparing these options to incredibly cheap wipes (that won’t do the job very well), you’re still going to save money with either of these two options.